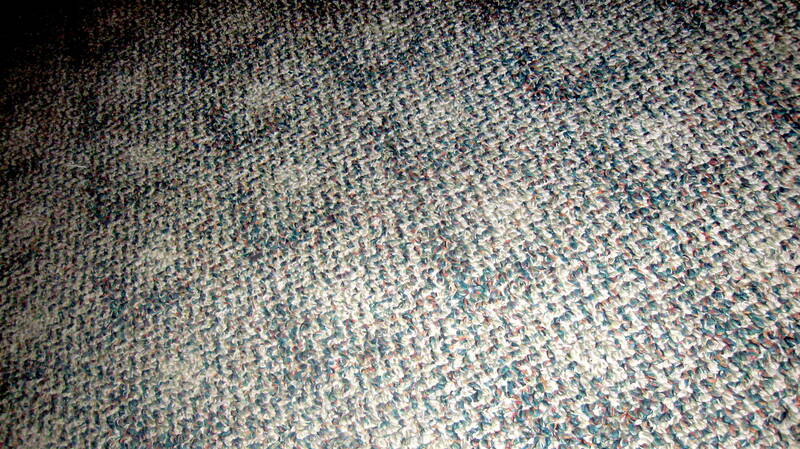 My beautiful carpet: I love both the colors and & designs in it which so complement my eclectic taste in decor. I at one time had two Xanga blogs. I now currently have just one, because I plan to make WordPress the home for my second blog. That Xanga blog was known as C_Just_Bible, and I posted only Bible studies, devotionals, etc. At this time, I haven’t decided exactly what all I will post here, but I’ll start off with a short introduction. I am Carolyn, a retired teacher, a proud wife, mom, & grandma (o.k., & daughter, sis, aunt, friend, etc)… and I enjoy Facebook, blogging, reading, music, photography, creating, and more. I hope to meet old friends as well as new friends here. My goal is always to bring glory to the Lord Jesus Christ in all that I say and do. Well that pretty well sums up things for now. 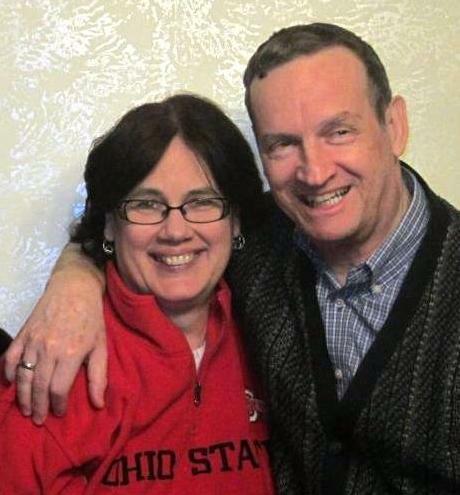 The picture is of myself with my best friend and husband, Mike. I have a very clever, fun daughter-in-law named Melissa. She is the mom of our three grandchildren. Although the family lives over an hour away from us and we don’t get to see them very often, she (& at times our son, or some of his in-laws) will post pictures and delightful stories about our grandchildren. 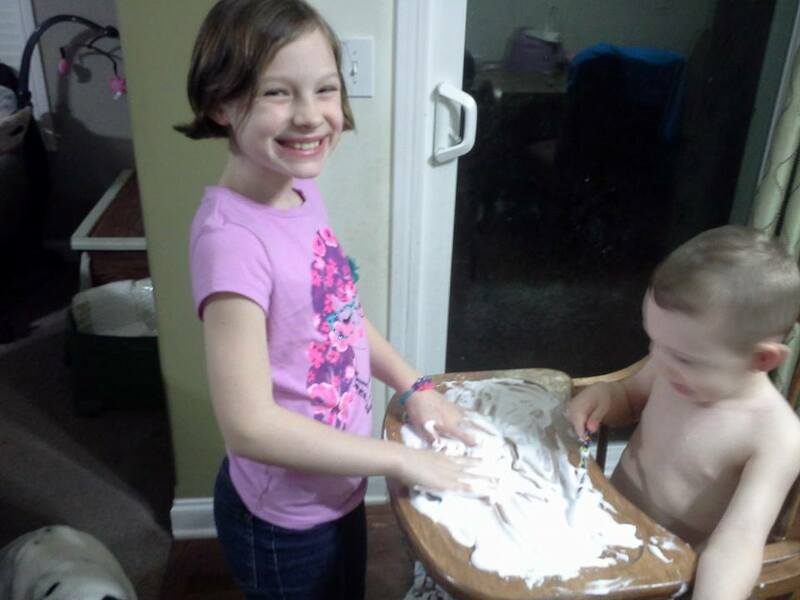 This blog is to show you some of the things that she has done with the children during these cold days when the oldest girl Tristen has been kept home from school due to the sub-zero, double-digit below zero wind chill weather. 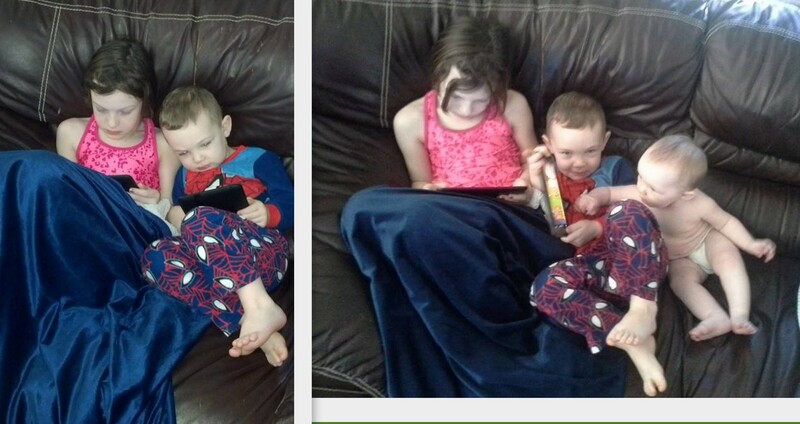 The first two pictures are of the two older kids reading/playing games on their new Christmas gifts-Kindles… and of Baby Girl Quinn “looking on” at Brogan’s device (I think I see a set-up!). 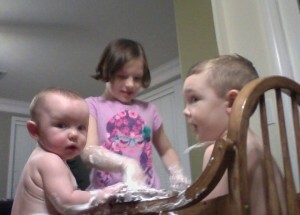 The next two pictures show the children playing in shaving cream. 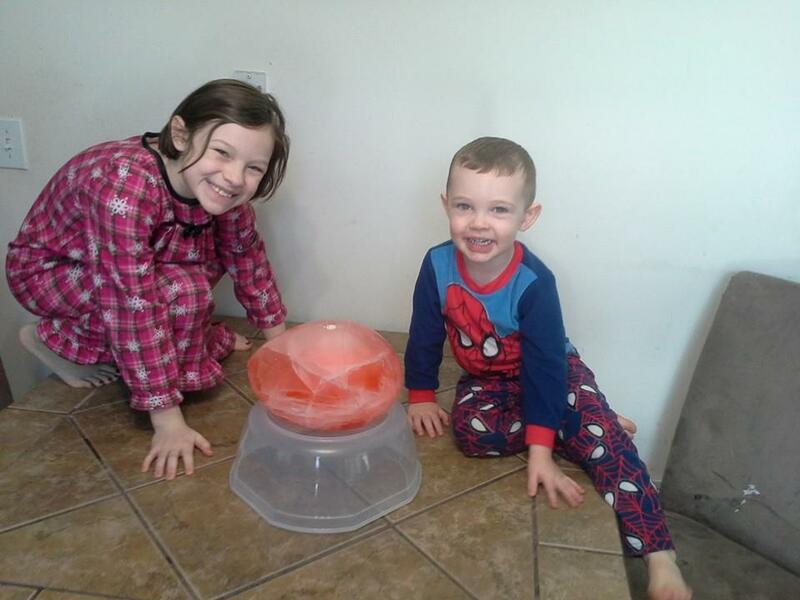 The next picture is actually from autumn, but it is another example of a fun indoor activity…. they ran and hopped across the bubble wrap in the hallway. 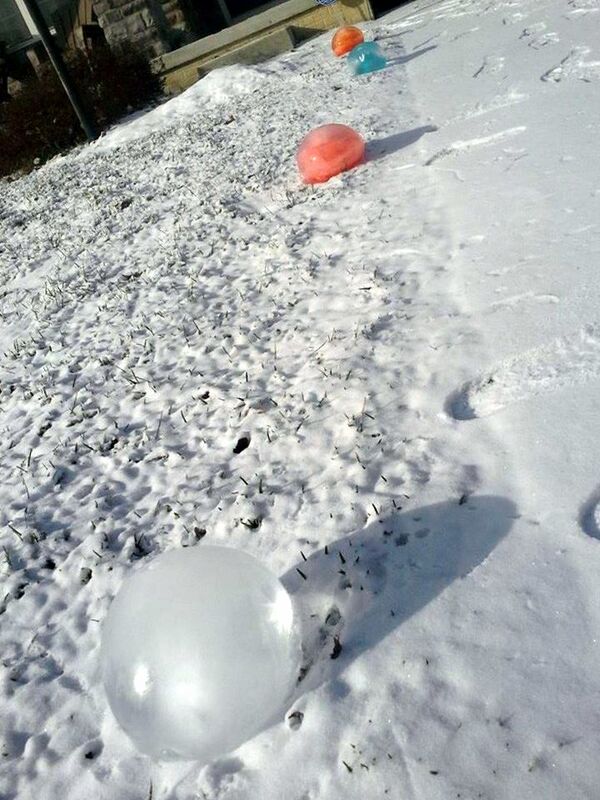 The last two show the Brogan and Tristen with one of the “ice-balloons” that they made with their Mom, and then the ice balloons decorating the front yard. So what sorts of things do you like to do inside? This Grandma likes to (& has been) cooking & baking; watching TV; reading; keeping up with folks, playing games, listening to music, & doing business on my computer; and spending extra time with family. I have other things I enjoy doing (but haven’t yet): counted cross stitch, jig-saw puzzles, and working with photos, just to name a few. 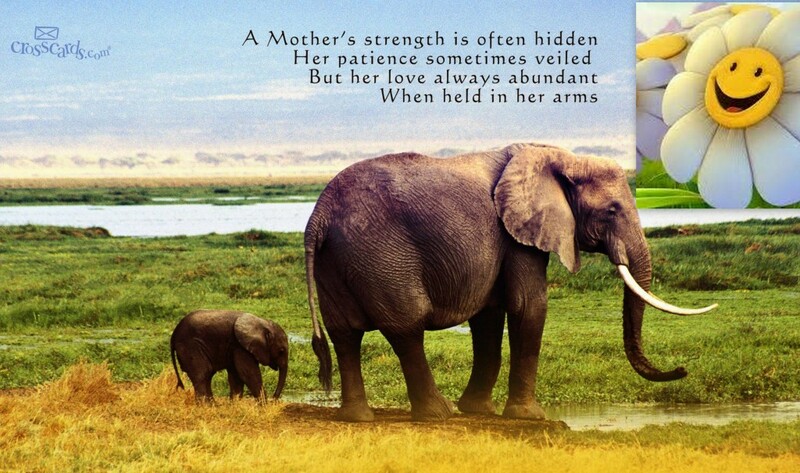 Here is my inspirational thought for this blog, in honor of my daughter-in-law. HAPPY 2014 TO YOU ALL!! !